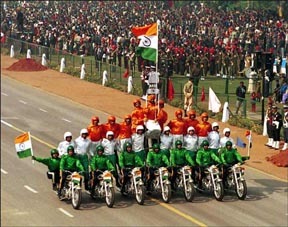 India will once again celebrate its Republic Day on January 26, 2006; it's fifty-sixth. Indians will once again look forward to witness the grand spectacle of the display of India's military might by the Indian Army and the other two Services on Rajpath in New Delhi and beamed across by TV to millions others. 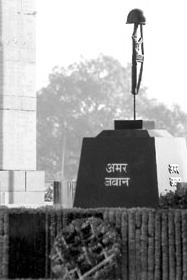 It is preceded by the Prime Minister laying a floral wreath at the Amar Jawan Jyoti at India Gate (memorial to the Unknown Soldier) paying a national tribute to the thousands of Indian Army officers and soldiers who since 1947 have laid down their lives to defend the Indian Republic against external and internal threats. Indians all over the world today feel proud to be a part of an India on the move towards emerging as a key global player. Indians also feel proud that today the Indian nation state figures in the strategic calculus of all the global powers because of its unfolding strengths, political stability and economic growth. At such a solemn moment it becomes incumbent on every patriotic Indian to ponder for a moment the tremendous contribution made by the Indian Army to the emergence of the Indian Republic and the sustained defence of its national sovereignty and India's national interests. When so pondering, Indians should imagine as to what would have become of India had the Indian Army followed the path followed by the Pakistan Army in Pakistan. Both India and Pakistan got independence at the same time and both these Armies were heirs to the glorious traditions fostered in the old British Indian Army. The political leadership in both India and Pakistan were devoid of a strategic culture and grasp of national security and matters strategic. How is it that while the Pakistan Army soon embarked on a history of military coups and military dictatorships lasting till today, the Indian Army in marked comparison continued to be apolitical and also partook in nation building activities besides its primary task of defending India's far flung and remote frontiers. The Indian Republic owes a debt of honor to the first Indian Army Chief, Field Marshal K M Carriappa and the first generation of Indian Army Generals and those whom they groomed and who followed thereafter who strongly upheld the ethos that the Indian Army should continue as a apolitical Army. This, despite the fact that Nehru continued to harbor suspicions about the Indian Army, fearing that it might go the Pakistani way and who had a devalued perception of the requirement of an Army. It took research by an American Professor to highlight that India's independence was considerably hastened by the British Intelligence Services reports that the Indian Army officers were becoming restive for independence and that the British would then have no resources to hold on to India. He also highlighted the tremendous contribution to India's independence of the Indian National Army led by Netaji Subhas Bose and formed from the Indian Army officers and soldiers who had to follow the British surrender to the Japanese at Singapore in World War II. It is a pity that Nehru initially refused to defend them at the Red Fort trials by the British and thereafter discounted their contribution as that would have eclipsed his own role. The historical fact is that the contribution of the Indian Army to India's independence was no less substantial than those of the politicians. In subsequent years, despite a limited call on India's national resources for defence expenditure and yet being called to face increasing threats from both Pakistan and China, the Indian Army by its grit and dedication to the Indian Republic thwarted Pakistan in four wars. The only time it went under was against China in 1962, not because it lacked valor or leadership but because of the political leadership of Nehru who was found wanting both in terms of misreading China's intentions and not allotting adequate resources for war preparedness to the Indian Army in the preceding period. In the last sixteen years the Indian Army has faced the onslaught of Pakistan's proxy war and terrorism and losing hundreds of lives and others maimed. In combating this threat the Indian Army has had to fight with one hand tied due to the political considerations of successive Governments, either due to electoral considerations or external pressures. Whenever the civilian machinery fails whether it be law and order, natural calamities or disasters it is the Indian Army that steps in for relief and assistance. The recent relief assistance provided by the Indian Army during the Kashmir earthquake in October 2005 won not only the gratitude of the average Kashmiri but also of the international community. The Indian Army has also done India proud in the many UN peacekeeping operations all over the world for which it has been highly praised by the United Nations. A glorious record of such services and sacrifices of the Indian Army surely deserves the nations gratitude not by rhetoric on every Republic Day but by more meaningful manifestations which surely every Government is aware of but does not concede. The average Indian citizen can contribute by being more aware of India's defence preparedness and monitoring the Government of the day in terms of allotment of adequate financial resources for war preparedness and that extraneous political considerations do not delay defence acquisitions. More importantly, they should ensure that the political leadership of the day provides realistic political component of national threat assessments of actual, potential or adversaries in the making so that like 1962 the Indian Army is never again has to face a military humiliation for no fault of its own.